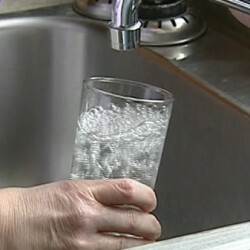 You are here: Home » Drinking Water » Want to lose weight? Water Helps! The following link is a link to an article and three video clips taken from CTV news in Canada. CTV is the leading national television networks in the country: http://toronto.ctv.ca/servlet/an/local/CTVNews/20100823/water-diet-100823/20100823/?hub=TorontoNewHome . The videos include a report on the study about the effects of water on diets, an interview with a nutritionist, and an interview with a physician who specializes in weight loss. When I first clicked out the videos, I had to sit through a 30 second advertisement, but it was worth the wait. If you are serious about learning about losing weight, read the article and watch the videos. For those that want to get to the bottom line right away, the article talks about a study of people tested on a weight loss program. The study found that patients that drank two glasses of water before meals lost 15 pounds while those eating the same diet without the two glasses of water lost 11 pounds. Dr. Bernstein, the leading weight loss doctor in Canada talks about the importance of drinking water when dieting. The video of the physician talks about how drinking more water can naturally lead to losing 5 pounds over a 12 week period. All of the videos talk about the importance of replacing pop and juices etc with water, as it will save about 400 calories per day or more. I have covered all this stuff before on the blog, but it is nice to see that doctors and ports are starting to make news with features on water.